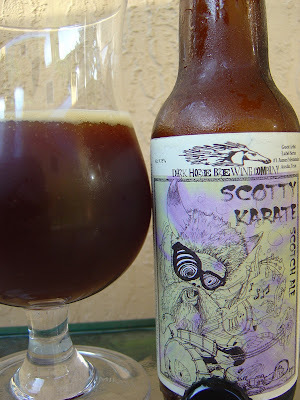 Today I'm drinking Scotty Karate Scotch Ale brewed by Dark Horse Brewing Company in Marshall, Michigan. This is Beer 2 from Trade 2 with Marathon Marie. First of all, what a fantastic name, which I am fairly certain comes from this dude. 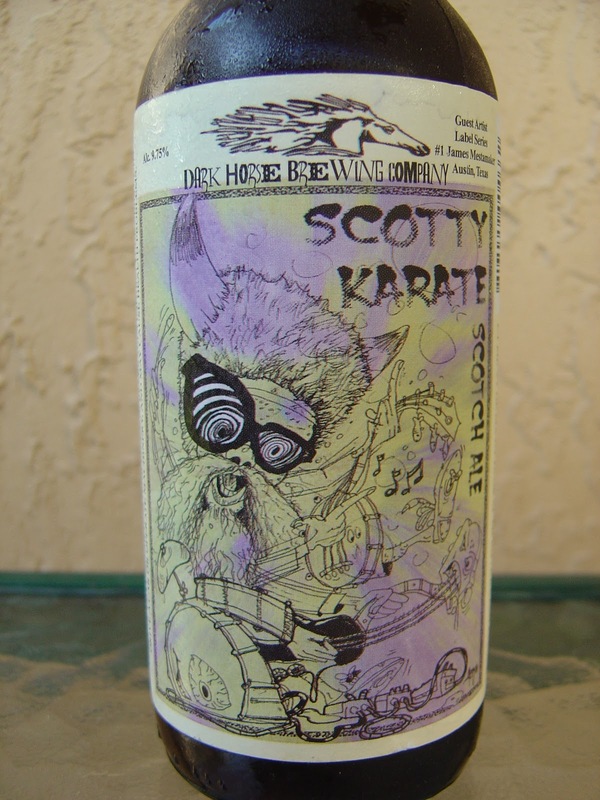 The label is also pretty cool, done by James Mestamaker from Austin, Texas, as the first in their Guest Artist Label Series. My interpretation, before digging for more information on Scotty Karate, was that the it shows a horned Gremlin with big RUN-DMC glasses getting all loopy on LSD while playing every instrument in the band simultaneously. Hmmm. Fabulous caramel aroma over top of powdered cocoa powder. Rich caramel and brown sugar flavors dominate the start. There are then some roasted malts with hint of smoke in the background. Next, a flood of vanilla comes along to wash those all away. A sweet start for sure, but some hops along with the 9.75% alcohol really do an excellent job thinning that away and providing a mild, and welcome burn. Nice and spirits-tual! Smooth texture, of course with that alcohol bite. Good medium body, medium carbonation. This is a really nice beer and I wish I had more right now. Go check it out if you can! Glad you liked it! I've haven't seen much from Dark Horse around here but I was really impressed with their oatmeal stout. I'll be looking for more now. This was a really great beer. It sounds like they have a lot of pretty good choices based on your blog post and Telissa mentioning even another great one. I don't know anything about their prices, but I certainly feel that price bug ringing in my ear too! I'll have to dig through and see if they have it. And now that I found this place, I can play along better. Thanks for the cool post. Cervezas is certainly a cool bar with lots of awesome beers. You found the right spot. You won't find Scotty Karate there as I got this in a trade from out of our distribution area. But they will have some great Scotch Ales! Recently I have drunk it and I feel just awesome. Thanking for you great post. Its time to cheer up.